As your trusted IT partner and advisor, we know that a properly designed computing network, running at peak performance, is the backbone to your business success. With over 35 years in the information technology business, the network engineers at WPS help Oklahoma businesses maintain optimal productivity and operational efficiency, with a technology environment built for your needs. 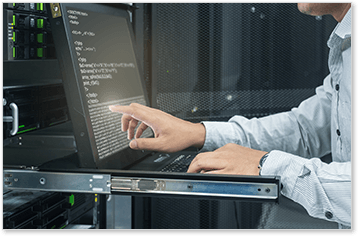 Our network engineers will design and plan a computing infrastructure configured to your specific operation. Our implementation team will wire your location and install all hardware and software, taking care to troubleshoot your system to identify and correct any issues before launch. Our expert engineers will maintain your data and communications network, ensure that it’s running as expected, and provide on-site or remote tech support when you need it. From strategic planning to purchasing, for simple desktop networks or large-scale LAN/WAN systems, WPS is all about network technology—and ensuring our customers get the best service and support available. Need to upgrade your network or talk IT? Tell us how we can help.